Believe it or not, it was even down hill from there! Things got worse. By the time the schools realized this was not going according to the weather predictions and they needed to close the schools, it was too late. Buses never left the school or soon turned around to come back. By 11:30 a.m. hundreds of thousands of people were in full panic mode trying to get to their children or trying to get home – or both. 11:30 a.m. was also about the time that the Rocky Ridge Fire and Rescue department came to the church offices and asked if we could shelter people because they believed many were going to be stranded. By noon, all of our staff had left for home or to take care of children except for Regina Houser, our Weekday Education Director who was caring for children and stressed out parents who could not reach them, the Weekday Education staff, Facilities Manager Mike Dennis, Administrator Steve Taylor, and myself. We began to make plans to provide for people and stay as long as needed. As the day progressed and the situation worsened, people began to come in for shelter. Gisele Glaze, my Administrative Assistant, could not make it home and (barely) made it back to the church facilities. We were soon joined by Stacey Boutwell, our Minister of Education, who was returning from the airport, became stranded, and walked four miles to get to the church. By mid-afternoon, the McDonalds and Krystal down the hill from our church facilities were jammed with stranded people and no longer open for business. By God’s grace, we happened to have a church member in each restaurant and they brought many people on foot up the hill to Lakeside. Cheryl Lea and Becky Akers were God’s provision in so many ways! By around 5 p.m. it was clear that we were going to have around 40 weekday children to care for overnight whose parents could not reach them and dozens more adults and children who got here after being stranded on the roads. We surveyed the church kitchen and found enough chicken fingers, french fries, and frozen pizza to feed everyone dinner. We also had an ample amount of drinks and snacks on hand for the overnight hours. As the evening progressed people kept arriving. At 2 a.m. a mother and her two young children walked up to the door after being in their car on the interstate for ten hours. More people came at 3 a.m. We were able to offer each one some food and warmth. Other than the weekday kids and their staff, everyone slept on the pews in Lakeside’s worship center. Because we live in the age of smartphones and social media, we kept up with the stories of many family and friends all night long. It was a long night. Wednesday brought a little sunshine and some improvement to the roads. All of the Weekday children were able to be reunited with their parents by late that afternoon. Nevertheless, we still had around a dozen people spend Wednesday night at Lakeside because they still couldn’t get home for various reasons. By noon on Thursday, everyone was able to leave for their destination and the sun was shining brightly most of the day. Over that 48 hour period, the stories that unfolded were truly incredible. Thousands of school students stranded at school. Thousands of people who spent the night on interstates. 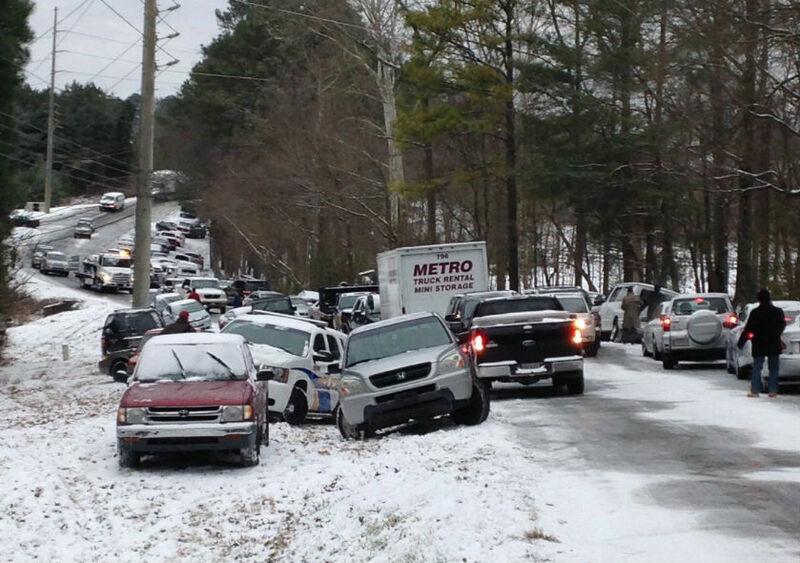 Thousands of abandoned cars all over the metro area. Families separated for two days. It was certainly a traumatic event for our region that cast all of us quickly into fear and unknown. 1) God provides. We know this truth, but at times like this storm we see it in a profound way. God provided for Lakeside – the facilities we have, the people who wound up here, and the supplies that we had. Therefore, Lakeside was able to provide shelter for so many. I heard countless stories of people who were helped by total strangers. 2) The church is here for the community. It was a privilege to be able to open our doors and be here for anyone in need. While that is true all of the time, this week was a tangible reminder that our church is here for the community. It’s easy to get consumed with ourselves and have an inward focus. People all around us are hurting every day – not just when there is a storm. It was a privilege to witness of Christ to many of those who stayed here. 3) I lead a great team. I cannot say enough about how Regina Houser handled the situation in our Weekday. Steve Taylor, Mike Dennis, Gisele Glaze, and Stacey Boutwell went above and beyond the call of duty in every way. Cheryl Lea and Becky Akers were honorary staff members for these two days and we couldn’t have done it without them! Even though we housed 120+ people overnight on Tuesday, I did not hear a single complaint or problem. Everyone was so appreciative and complimentary. That’s a direct result of the leadership and servant spirit of our team. 4) People need Christ. We had people from all backgrounds here. Many did not know Christ. I am praying that the Lord will use the ministry and witness that we gave to sow gospel seeds in their hearts. I am challenged to be a greater witness because people are no less lost now that the storm is over. God is good. Praise Him! Bro. Greg, I love reading your posts. I am so thankful the Lord allowed you to be available to help those stranded. Thank you for being the arms of Christ during this storm. Thanks, Pat. You are an encourager!